Distributor: Currently licensed by Sentai Filmworks. Unlike the TV series, the OVA series is NOT available on Crunchyroll. Related Series: Girls und Panzer TV series, various specials. Also Recommended: Strike Witches, Bodacious Space Pirates, Sound of the Sky, Taisho Baseball Girls. Notes: There's also a manga by Ryuuichi Saitaniya, serialized in Monthly Comic Alive, and a novelization by Yuu Hibiki. I'm still uncertain which of these, if any, are based on the others. The Girls und Panzer OAVs mostly feature half-length inbetweeners about various aspects of the world the girls in the show live in. Still, while one required a certain amount of suspense of disbelief to be able to swallow everything the TV series unloaded on us, I believe it left the viewers with some questions that needed answering. Questions about how the fight against Anzio went (Ooarai's victory notwithstanding, and this answer won't be provided by this particular OAV.) Questions about how the hell those giant school boats work. And also some questions you didn't even know you had before you watched this. Questions like... are the creators of the show Monty Python fans?! I mentioned that the original TV series was actually quite sparse with its fanservice, and the OAV certainly ramps that up a bit. The first two episodes has the girls wear mostly swimsuits -- in fact, the first episode goes a little overboard with a disturbingly creative range of swimsuit designs and even a little historical lesson on various swimsuit styles through the ages. (Victorian Romance Emma actually confirms one of those styles.) Not that any of the swimsuits are needlessly skimpy, but the swimsuit shop itself is confoundingly large, and a lot of the suits themselves come with emblems of various millitary tank batallions. Then, in the second episode, it's off to a riverside area for some camping-related shenanigans and a small history lesson regarding millitary rations. Try not to stare too much, OK? Really, the only thing this OAV series has a shortage of is actual tank battles. You'll still see the tanks, but they mostly serve as background props this time around. The third episode actually give you an indepth look at the ship itself, an impossibly gargantuan seafaring vessel designed not entirely unlike a hangar ship, but with a whole city and surrounding countryside resting on its surface area. If you can get past the most likely event that a ship like that might not be feasible (never mind the damage it'd do to the underwater ecosystem even if it was), it's a surprisingly well-designed and even researched world the girls live in. The episode ends with a hotspring scene that, again, ups the fanservice ratio compared to the TV series, but not so much to make it an uncomfortable watch for people who aren't quite on board with that sort of thing, no pun inten-..
...OK, I admit it; I made that one on purpose. The fourth episode is the one standout for being a mere five minutes in length. It's basically just the full version of that really embarrassing anko dance the girls were made to perform in the original TV series after their loss against St. Gloriana. There's not much else to say about it. And the last episode is also one with a confirmed time stamp; namely after Ooarai's big victory in the finals, wherein the girls arrange a party complete with entertainment in the form of each of the teams doing performances outside of their expertise or comfort zones. This mostly consists of singing and stage performances, many of which are actually quite amusing, and even a little bit impressive. And weird. "PLEASE, BETH! TAKE OFF YOUR HAT WHEN YOU'RE ON YOUR DEATHBED!" So, the question remains; is the OAV collection worth it? It's going to depend heavily on what you're looking for. 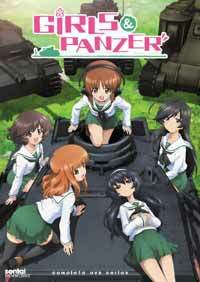 Unlike the TV series, there is a grand total of zero minutes of actual tank battles in this OAV collection. They don't even drive said tank as much as a single meter (or foot, if you're an american.) The OAV collection is basically a bit of a break from the battles, instead focusing on taking a break, having fun and giving their surroundings a closer look. The completist in you should definitely want it, as it's enough new material in this series to cover a whole movie. (The total runtime is around 85 minutes, though that does include the opening and ending themes too, so...) But despite actual tank nerdery taking a back seat this time, the show still captures that exceptional level of outlandish fun and informative extravagance. If you got the original show on DVD or Bluray instead of just choosing to rewatch it on Crunchy every time you feel like it, you should definitely go for this collection as well. Recommended Audience: The OAV series does ramp up the fanservice a bit compared to the original TV series, mostly in the swimsuit department. But don't get your knickers in a twist, GuP fans; it's still very tame compared to other shows out there that basically LIVE on said fanservice. Version(s) Viewed: Region A/B Bluray, bilingual. 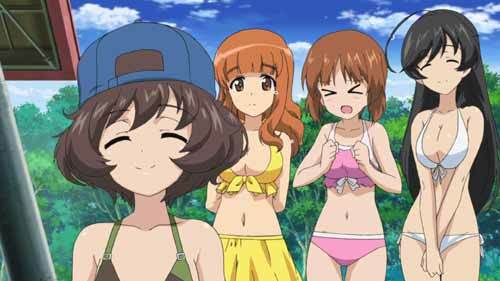 Girls und Panzer (OVA) © 2012 Actas, Lantis.